Many of us will spend hours removing weeds from our garden to give our vegetables and herbs the best possible chance to grow well. You can then compost these weeds, or burn the worst ones, but did you know that some of the most common garden weeds are edible? It’s important to make sure you never eat anything you’re not one hundred percent sure of, as some weeds are poisonous or can be easily confused for poisonous species. Avoid picking them from areas that have been sprayed with chemicals or are close to sources of pollution such as roadsides, and always make sure to wash them thoroughly before using. The dandelion is the scourge of every lawn perfectionist, and is one of the most distinctive weeds with its bright yellow flowers followed by pompom-like seed heads. Dandelions grow prolifically, appearing in lawns and paving cracks. They have a long, delicate taproot, which makes them difficult to eradicate. Dandelion greens can be eaten raw or cooked, as a salad or in soups. Either pick off the leaves as they appear, or harvest the whole plant (root included) saving the leaves and disposing of the rest. Raw leaves have a bitter taste, so harvest them in the spring or early fall when they are at their sweetest. The flowers are edible too, and taste best when they are young. Make sure they are clean and free of bugs by soaking in a bowl of water. They look great whole or shredded in a salad or as a garnish to soup, and they can also be made into dandelion wine. Avoid using them in large quantities though, as they can have a diuretic effect. 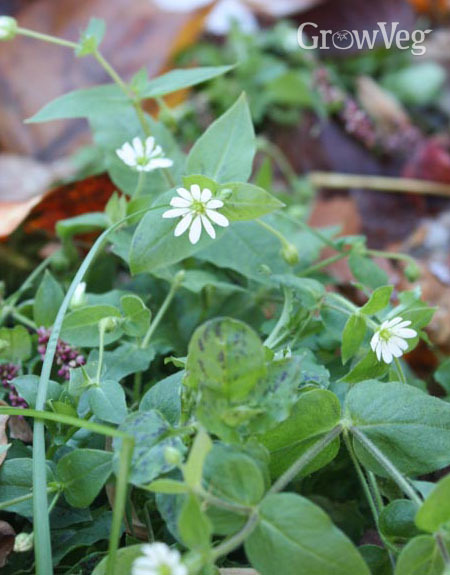 Chickweed is an annual wild edible that will grow almost anywhere. It can be easily distinguished by looking for the fine hairs which appear only on one side of the stem in a single band. It creeps and spreads across the ground, which makes it easy to harvest, by just pulling up a clump with your hand. All parts can be eaten – add raw, young stems and leaves to salads or use it in sandwiches as you would do cress. If adding it to cooked dishes, add during the last few minutes of cooking to preserve its delicate texture. Purslane is an annual trailing plant that thrives in poor soil, especially dry, dusty ground. It has a distinctive thick, reddish stem and succulent green leaves. You can eat the stems and leaves fresh in salads or sandwiches or use them in soups or in recipes that call for spinach. Purslane has a certain sourness to it, which varies depending on the time of day it is picked – it can be ten times more sour when picked in the morning compared to late afternoon, so harvest this interesting little weed at a time which suits your palate. It’s easy to confuse purslane with a poisonous plant known as hairy-stemmed spurge, so always make completely sure you know what you’re picking and if in doubt, throw it out. Whether you know this weed as lamb’s quarters or fat hen, Chenopodium album is an annual wild edible that tastes similar to chard. Fans of leafy greens such as kale, collards, and spinach may enjoy this. It thrives in gardens, in damp areas near streams and in waste ground. All parts of the plant except the roots are edible, but this weed contains oxalic acid (also found in rhubarb leaves) which can cause stomach ache in large amounts, so it’s best to use it sparingly. Saute whilst wet in a little olive oil and season, steam it or add it raw to smoothies and juices. Red clover is often found in grazing pastures or on grassy roadsides, or it can be sown as a green manure as part of a crop rotation regime. As a member of the legume family it’s good at improving nitrogen levels in the soil, which is useful for plant growth. The leaves can be added to a salad, but it’s the flower heads that are the most useful. The magenta-coloured heads contain many smaller flowers, which look great in salads whole or shredded, or they can be infused in hot water to make a refreshing tea. Stinging nettles are familiar to most gardeners, if only because of their powerful stinging properties! The sting is caused by a series of hollow hairs which have a small swollen base filled with formic acid. When the hair tip pierces the skin, the acid causes an annoying itch or burning sensation that can last several minutes or longer – so you should always wear gloves and keep skin covered when working with nettles. The leaves, stems and the roots are all edible, but the young leaves that appear in spring are the best to use, having a spinach-like taste. Due to their stinging properties, never eat them raw. Instead they can be cooked like spinach or made into a delicious nettle soup or a pesto, or they can be dried and stored for later use. Nettle beer can be brewed from the young shoots, or add young leaves to boiling water for nettle tea. They can also make a nutritious plant feed for your veggies - see our video or article on making your own homemade plant feeds. Ground elder is a tough weed, out-growing almost anything else that might try to grow near it. It’s a clever plant, spreading prolifically both by seeds and by a series of spaghetti-like underground runners. In some areas it is legally controlled as an invasive weed. Mature leaves have a strong, unpleasant taste, so are not recommended. Instead, choose the youngest, freshest shoots, preferably ones where the leaf hasn’t yet unfolded. It’s the leaf stems or petioles you want to eat – fry them in a little oil and serve as a tasty side dish, or use them with some nettle tops and mushrooms to make a tasty pasta sauce. Weeding need never be a chore again. Instead you can weed your way to a free lunch, and discover exciting new ingredients to go with the tried and tested produce you’ve lovingly grown!